Red Dead Redemption 2 is coming out in a matter of days, and fans of the franchise are getting pretty excited; and for good reason, if the many hands-on impressions we've seen from various gaming outlets are anything to go by. 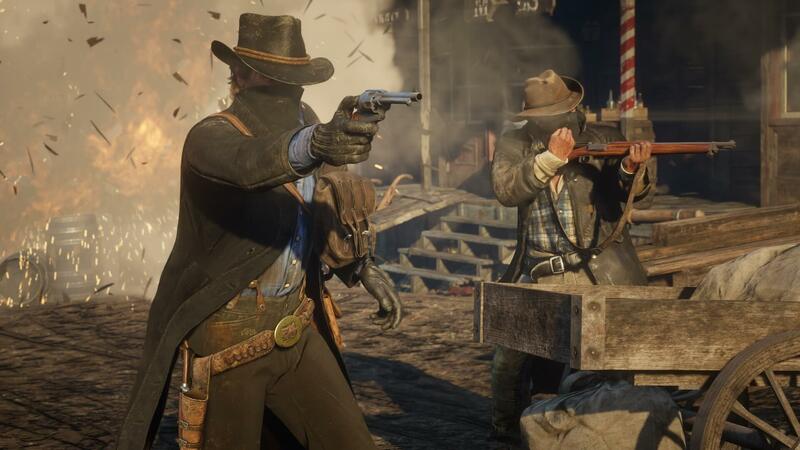 However, in addition to the brief gameplay teasers officially given to us by Rockstar, as is often the case with major impending releases, gameplay leaks are beginning to hit the web. Rockstar's PR department is undoubtedly pulling them down as quickly as they show up, but one short, 23-second clip has remained alive for now (more mirrors and a gif version). It doesn't show anything particularly impressive, but it does give us a slightly better idea of how the game's guns will handle, and how the law system might work. In the video, the player is approached by what appears to be three Sheriffs or bounty hunters. Instead of outright attacking the player as they would have in the original Red Dead Redemption they enter an "Interrogating" phase, where it appears like the player can interact with them using L2. We've seen hints of RDR2's NPC interaction system in the previously-mentioned official gameplay videos. Players can antagonize, soothe, or just chat with both passerby and lawmen. In this short leaked clip, the player elects to whip out a sawed-off shotgun and a revolver to let his bullets do the talking. It's worth mentioning that the framerate also appears to be quite stable, despite the high-fidelity visuals in the foreground and background. It's tough to say how it will feel in action without trying it for ourselves, though. If you'd prefer to avoid any sort of spoilers and play the game for yourself, you can pre-order RDR2 ahead of its release on Friday via Rockstar's official website (or your retailer of choice).